2012 was a warm and dry vintage at the Whalebone Vineyard in Wrattonbully. The 38 years old vines responded to the 53% of average summer rain received at Whalebone Vineyard in vintage 2012 by producing a very modest crop of concentrated grapes, which were harvested 2 weeks earlier than normal between the 20th and 24th of March. The heat summation for the 2012 growing season at Whalebone was 1596C days compared to the average for the past 10 years at 1446C days. Much of the above average heat was in the early growth month of November and the ripening months of February, March and April were close to the average. The hand selected bunches of Merlot and Cabernet Franc from Whalebone Vineyard were separately de-stemmed, partially crushed and chilled to 2C into tubs containing 0.9 tonnes. After a 4-day cold maceration the tubs began fermentation and were hand plunged each day for the 10-day duration of fermentation. The maximum temperature reached at the peak of fermentation was 34C and after the completion of fermentation the tubs were sealed down for a 7-day post fermentation maceration. The tubs of Merlot and Cabernet Franc were separately tipped into a small airbag press and pressed straight to French oak barriques, 70% 0f which were new and the balance 1 use. Malolactic fermentation occurred in barrique in the spring and barriques were racked off full lees and the wines were sulphured and returned to barrique for another 15 months. In January 2014, the wines were clear racked from barrique and 66% Merlot and 34% Cabernet Franc were blended ready for bottling on 18th of February 2014. 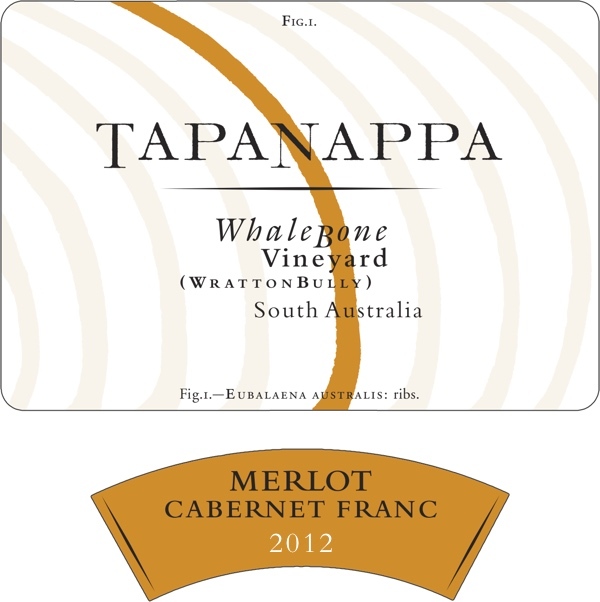 Tapanappa 2012 Whalebone Vineyard Merlot Cabernet Franc is absolutely typical of this unique blend and reflects its synergy with the special terroir of the Whalebone Vineyard. The wine is translucent and vibrant in colour and the aromas are floral and of fine leather, cedar and spice. This is an elegant wine of great fruit and tannin finesse contributed by the Cabernet Franc built around a dense core of sweet fruit from the Merlot. This wine is a pure expression of the unique Whalebone Vineyard terroir. Bottled in February 2014. Only 400 dozen grown and made.